I just returned from the incredible Cleveland Thyagaraja Festival, an event now in its 41styear that features over 120 of the top musicians from southern India as well as 100’s of talented and dedicated North American born/based Indian artists. At the festival, we successfully launched the new जगृथि (Jagrithi - Awakening) group in front of an overflowing audience at Cleveland State University’s Drinko Hall. जगृथि is a collaborative ensemble of musicians from India and and America, rooted in a wide range of musical and cultural traditions. The group creates new music steeped in these traditions, with a focus on music’s potential to foster a spiritual reawakening of mankind. You can hear this exciting new project in Michigan next week on April 15th at 4pm in OU’s Varner Recital Hall, sponsored by the Great Lakes Aradhana Committee. At Oakland University, we are wrapping up another successful semester tomorrow and next weekend with three terrific programs featuring Sam Jeyasingham and Robert Chappell.Tomorrow’s 8pm percussion ensemble concert will feature Prof. Jeyasingham together with the OU percussion ensemble and world percussion ensemble, presenting a program of percussion music from Asia. The concert will include music from India and Japan, as well as works by American composers inspired by Asian music traditions. 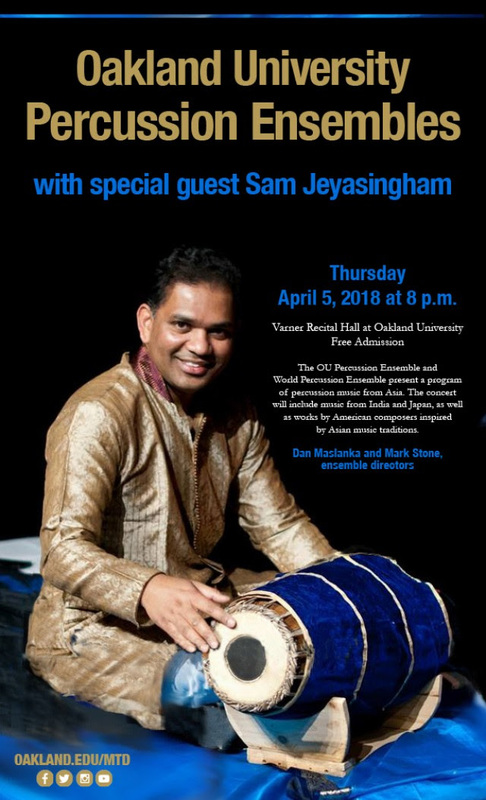 Originally from Sri Lanka, OU Carnatic percussion instructor Sam Jeyasingam is a virtuoso performer and master teacher of several Indian percussive art forms. 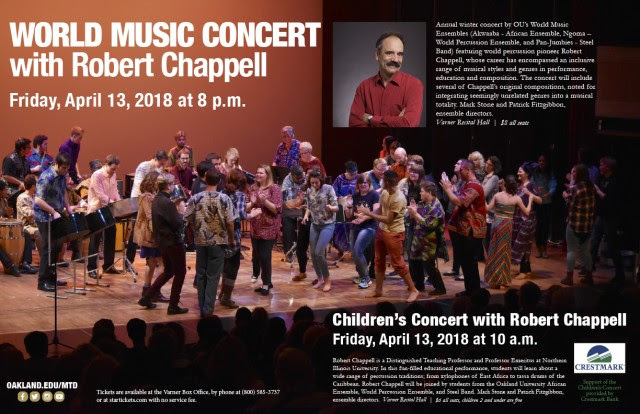 Then next week distinguished professor emeritus from Northern Illinois University, Robert Chappell, will be in residence with our world music ensembles. On Friday, 4/13 Prof. Chappell will conclude his residency with a morning children’s concert at 10am and a full evening concert at 8pm. Both of these programs will feature OU’s Steel Band, African Ensemble, and World Percussion Ensemble performing traditional African and Caribbean music as well as Chappell’s original compositions, noted for integrating seemingly unrelated genres into a musical totality. Finally, on Sunday April 29th at 4pm, I will present the debut of my newest group, the Stone Sound Collective, at Oakland University. 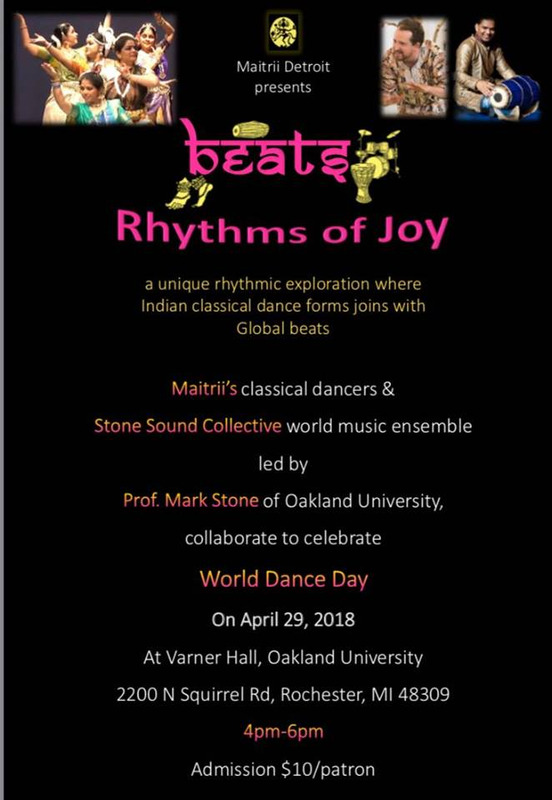 We will be taking part in a special performance to celebrate World Dance Day together with the Indian classical dance group, Maitrii.